Learning To Use Your Cricut Machine. 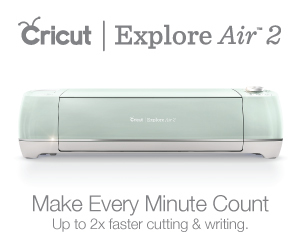 Having got my Cricut Explore Air 2 I then had to learn how to use it ……. properly …… I really didn’t want to wreck it!! I followed the set- up instruction which were great and even made a little card. The machine comes with card stock so you can follow the set-up instruction which ends with you making the card. Such a good idea, but of course that is only the beginning of my adventure of getting to know my Cricut! I went looking on YouTube to find more information on what others had found they could do with their Cricut machines. I really should have know better and just gone straight to fellow blogger Jennifer Maker’s YouTube Channel as she is such an inspiration and of course she has made a short series of videos just for beginners like me. I can’t recommend them enough. I watched them all – binge watching for crafters!! And now I am re-watching then one by one doing the exercise she sets after each lesson. Cricut Mini Course Lesson 3: Understanding Your Mats, Blades, Pens, Tools, and More! CLICK HERE to access Jennifer’s YouTube Course. When you register your Cricut you can access the Design Space which is where you work on your designs before you cut. There are series of videos explaining how the Cricut works and the Design Space. Watching these are vital to getting the most out of your machine. If you are like me you will be itching to get to work and create all sorts of things, but believe me it is worth your time to watch these videos. You can register and get access to Design Space and possibly, I’m not 100% sure, the videos before you buy a machine – so you can get an idea if a Cricut is something you will use. They aren’t cheap, but having seen what they can do I decided they are an essential piece of the crafters equipment and a lot less than playing golf and needing clubs, balls shoes and membership of a club!! CLICK HERE to access Cricut Design Space. I made three cards the evening that I got my Cricut, just couldn’t resist using it straight away! The “enjoy’ card was the demo card that they walk you through after you have registered your machine. The “heart” card is my design as I wanted to find out how to use the Design Space and found a heart shape, printed it out and then adjusted the size and cut. All very easy to do. The cat card comes from Jennifer Maker and is one of a dozen easy cards she has for beginners and as part of her video course that is one of the assignments. It just gets you used to your machine. UPDATE – Since writing this post I have used my machine quite a lot – and have come across an issue, that when I spoke to other Cricut users online, seems a common issue for beginners. You need to be aware that the green mat, which is the standard mat that comes with the machine, is the one that is advised for card stock etc. However when new all the mats are very sticky, the purple mat is the stickiest for heavy materials, the green is standard & medium sticky and the blue is for light weight paper, parchment etc. and is the least stickiest. I used the green mat initially with some standard card stock and it was a disaster! It stuck and I had great trouble peeling it off, in the end I had to tear off what I could and then use the scraper from the tool kit I managed to get the rest off. I then washed it gently rubbing off the tiny pieces of card with warm water and a dash of washing up liquid. I rinsed and left it to dry overnight. No harm was done to the mat, I was a little frazzled to say the least! I have since learnt that you need a slightly heavier card stock when using the green mat until you have used it for a few months and it has become less sticky. I used the blue mat with the lighter card stock and it worked fine. So lesson learnt. Finding a good source of card stock can be a problem, but I have now sourced large sheets of good card locally which I find I can use with my green mat. I’m told Amazon and Scrapbook.com are good for card stock mail order and I am sure Micheal’s would have good card as well. I shall try all three and report back at a later time. I always think that the test of any new appliance or equipment is – if it broke tomorrow would you be very upset and replace it as soon as possible. I have to say that so far the Cricut fits into the category of yes I would definitely feel upset and yes I would replace it asap and I haven’t discovered all it can do yet! I think any crafter, and not just those in paper craft, would get great benefit from a Cricut and it is fast becoming as essential as a pair of scissors. There are lots of free SVG files out there as well as the ones that you have access to with a Design Space subscription so you are never going to be short of a project. Getting a Cricut for the first time is a bit of a learning curve, but as I said above if you watch the videos, and there are plenty more on YouTube, then you will be crafting very soon.